The Dilmah Chefs & the Teamaker 2010 took a group of intrepid chefs on a unique culinary adventure that covered some of the most exotic locations in Sri Lanka. 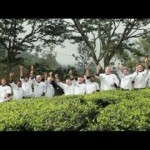 The chefs experimented with various Dilmah teas and Sri Lankan spices which culminated in an adventure of gastronomical delight on sandy beaches, in the wilderness with wild elephants, and on hilltops where our world famous tea grows. The chefs also interacted with different communities of Sri Lanka through the MJF Charitable Foundation and Dilmah Conservation.